A survey released by Roy Morgan in November shows the proportion of drivers requiring their main vehicle to be serviced or repaired three or more times a year has declined from 30.5% to just 18.4% in the past 11 years, according to Roy Morgan’s latest vehicle servicing survey data. 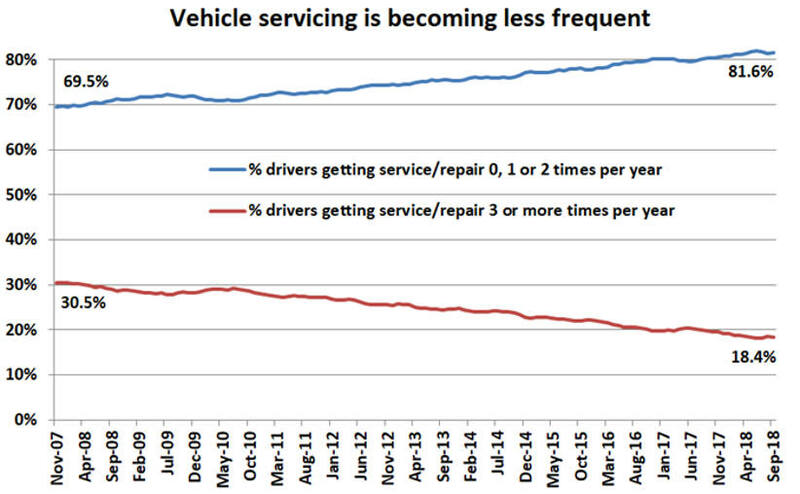 As vehicles become more reliable, the percentage of drivers requiring two or fewer services or repairs a year has correspondingly increased from 69.5% to 81.6% over the same period (see chart below). Maintenance costs are an important consideration for Fleet Managers when budgeting and developing Whole of Life Cost models. Traditionally the Fully Maintained Operating Lease (FMOL) provided by leasing companies helped organisations manage the unexpected costs associated with poor vehicle reliability. With more reliable vehicles the need for Fleet Managers to outsource maintenance risk is reduced. 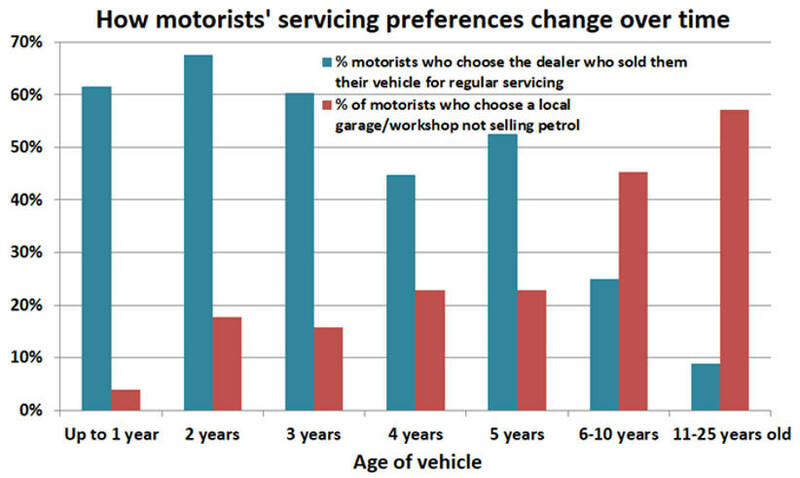 Motorists continue to show a preference for dealer-run service centres when their vehicle is new or near- new, with a tendency to shift to local garage service centres as the vehicle ages. This transition is most pronounced at the five-year mark, when many factory warranties or lease-hold agreements expire. Norman Morris, Roy Morgan Industry Communications Director, commented that “Vehicle servicing is becoming less frequent, which presents a problem for companies whose main revenue streams are derived from servicing work. This is a trend that is widely predicted to continue as the vehicle fleet gradually transitions from traditional petrol and diesel vehicles to new- generation hybrid or electric vehicles. “For dealers, the importance of servicing has a second dimension – it is their best means of forging and maintaining a relationship with their customers. “Although there is a clear move away from dealer-run service centres when a vehicle reaches five years of age, it’s important to remember that often that vehicle will not be owned by the original purchaser – many leasehold customers, or those who value having a late-model vehicle with a dealer warranty, become the next wave of new-car buyers. When it comes to driver satisfaction with various types of service centre, there is little difference between the various categories of dealers and local garage/workshops. 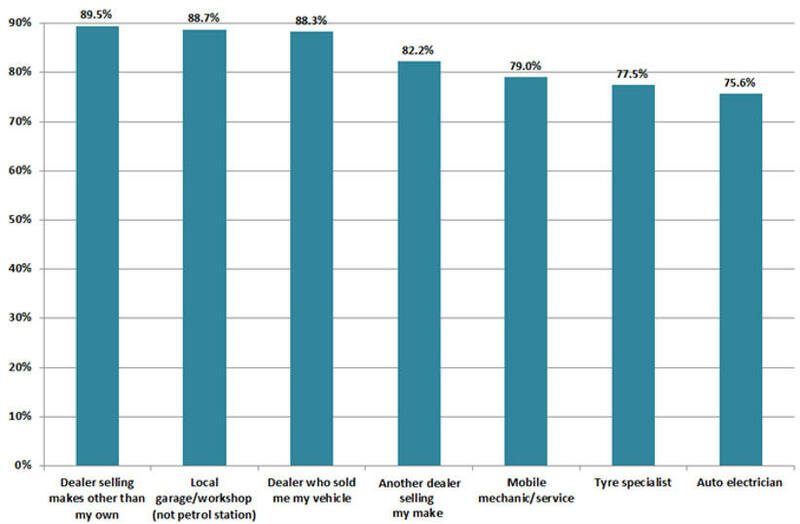 Service centres that rate most highly include ‘Dealer selling makes other than my own’ (89.5%), ‘Local garage/workshop (not petrol station)’ (88.7%) and ‘Dealer who sold me my vehicle’ (88.3%) (see chart below). Mobile mechanics were less popular, with an average total satisfaction rating of 79.0%, and tyre specialists and auto-electricians were less popular again, rating 77.5% and 75.6% respectively. The latest auto servicing data is collected as part of Roy Morgan’s Single Source survey, via in-depth, personal interviews conducted face-to-face with over 50,000 Australians per annum in their own homes, including 12,295 who rated their satisfaction level with various kinds of service centres.